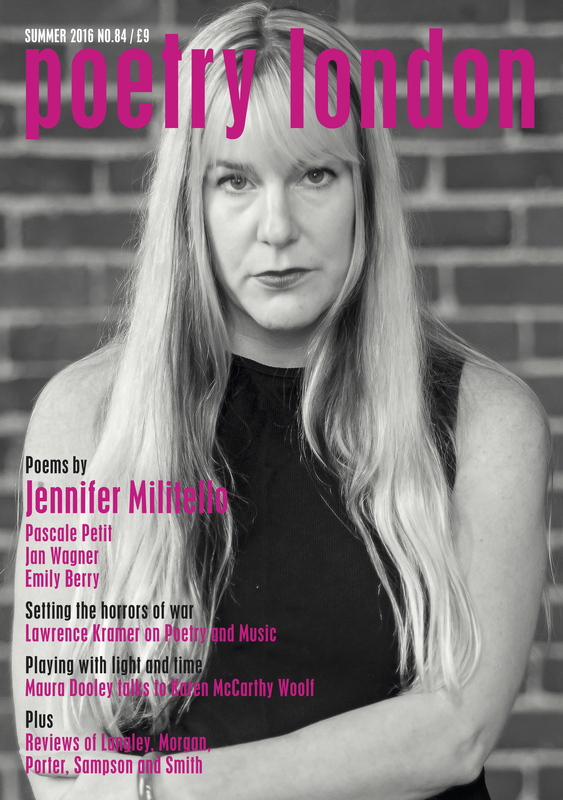 In the summer 2016 issue of Poetry London, Jennifer Militello, an exciting American poet new to the magazine joins Pascale Petit with a significant selection of poems. We have new work from Emily Berry, Ian Duhig,Rachael Boast, and Jan Wagner in translation, plus translations from the Italian by Jack Underwood. Newcomers to Poetry London include Joey Connolly, Alex Houen, Maria Jastrzebska and Natalya Anderson. In the review and features section, composer and musicologist Lawrence Kramer writes on setting poems to music, Karen McCarthy Woolf interviews Maura Dooley and reviews include books by Sarah Maguire, Stevie Smith, JO Morgan and RF Langley. To subscribe to the magazine, with this issue as your first, click here.